The discounts are very simple and easy to use. You have 3 types of discount: Flat, Percentage or Free Shipping. This is the name for the created discount. It helps you keep record and your customers will know what discount is being applied to their order. This is if you wish your customers to stack discounts for a product. 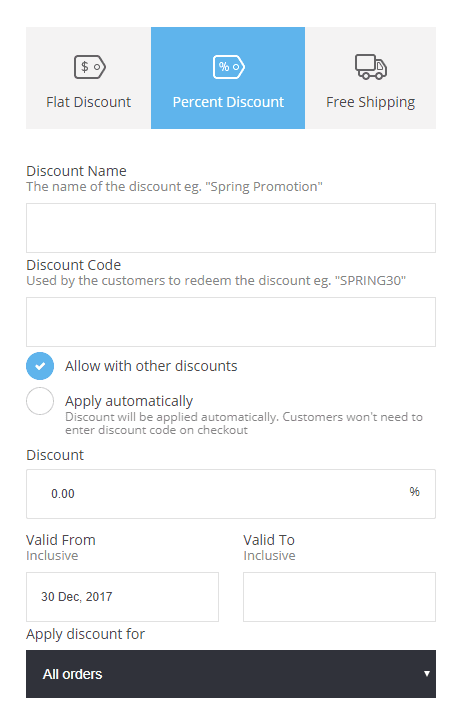 Example: You have a product that is already on sale with 20% discount and they apply 20% discount code will make it 40% discount for that product. The starting and ending date of the created discount.